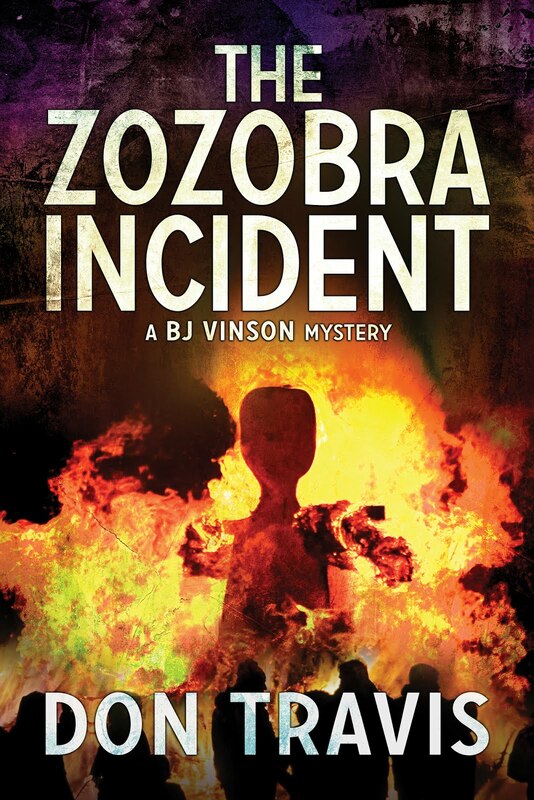 On August 8, 2013 I published a post on this blog called We Meet Jazz Penrod Again, in which the junior detective told our hero, BJ Vinson, he and his brother Henry Secatero had discovered a lead: A car parked out on the Navajo Reservation where it had no business being. Let’s accompany BJ and Jazz as they check out the situation. 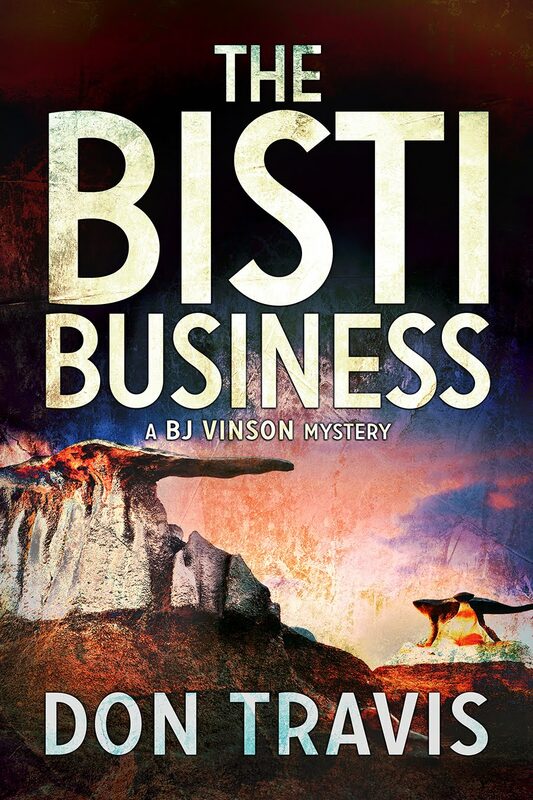 The following passage comes in Chapter 17 of THE BISTI BUSINESS, beginning on Page 139. This is not really the red rock part of New Mexico, but the massive, wind-carved sandstone shelves—some the remnants of ancient barrier reefs—glowed red and orange, striated with layers of black and yellow and brown and white. 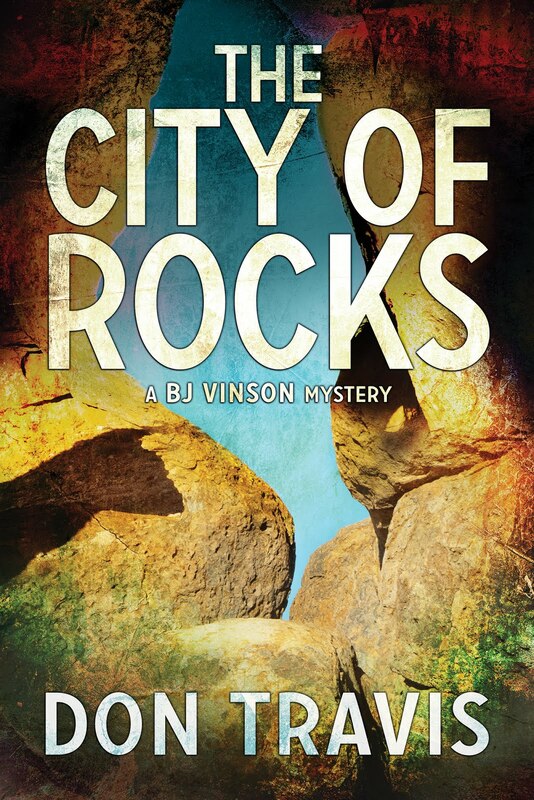 I identified feldspar and hematite, quartz and dark-brown calcite, degraded coal and gypsum embedded in the host rock, all deposited eons ago when the shallow marine sea retreated with the upheaval of mountains in what is now southwestern Colorado. Volcanic eruptions had spewed fire and ash over the entire area. As the water retreated, sand dunes consolidated into cross-bedded Entrada Sandstone. Over the ensuing ages, the ceaseless battle between wind and rock and water had chopped the terrain to pieces, creating the present landscape. The Shiprock monolith, which lay in the distance ahead of us, was the throat of a volcano that had died long ago. The terrain around it eroded and washed away, leaving a 450-foot pile of black basalt towering over the Navajo Nation. Long before we reached Shiprock, Jazz had me turn south on a rocky dirt road. As we began climbing. I kept a wary eye on the gas gauge Throwing the car into low gear to make it up and down the steep inclines of the washboard landscape was eating up the fuel. The rental sedan wasn’t made for this kind of country, and I was about to give it up as a bad venture when he pointed left. With more than a little trepidation, I followed his directions. My stomach fell along with the road as the earth dropped sharply. To our left, there was nothing but open air. The narrow ledge supporting us hugged the wall of the canyon—and it was a canyon, not a big-assed arroyo as he'd described it earlier. We dropped farther down the uncertain trail while tons of mudstone leaned outward above the car, threatening to shove us into the abyss. My knuckles turned white on the steering wheel. “Like someone wanted to hide it,” I rasped, desperate for the sound of my voice once last time before we ran out of road and pitched over into oblivion. We inched around the curve, and I tapped the brake. A car blocked our progress—a brown four-door Ford sedan. We didn’t need to get out of the car to know what had happened, but we did it anyway. The stench was overpowering. Something—or somebody—was dead. Without touching a thing, I peered through the windows and determined no one was in the passenger compartment. The odor seemed to come from the rear of the vehicle, so the body was in the trunk. Was it a confidential investigator called Hugo Santillanes or a kid named Lando Alfano? Hope you’ll be motivated to get a copy of the book. Thanks for reading. Be happy to hear from you.